Envy, irritation, paranoia--in contrast to powerful and dynamic negative emotions like anger, these non-cathartic states of feeling are associated with situations in which action is blocked or suspended. In her examination of the cultural forms to which these affects give rise, Sianne Ngai suggests that these minor and more politically ambiguous feelings become all the more suited for diagnosing the character of late modernity. Along with her inquiry into the aesthetics of unprestigious negative affects such as irritation, envy, and disgust, Ngai examines a racialized affect called "animatedness," and a paradoxical synthesis of shock and boredom called "stuplimity." She explores the politically equivocal work of these affective concepts in the cultural contexts where they seem most at stake, from academic feminist debates to the Harlem Renaissance, from late-twentieth-century American poetry to Hollywood film and network television. Through readings of Herman Melville, Nella Larsen, Sigmund Freud, Alfred Hitchcock, Gertrude Stein, Ralph Ellison, John Yau, and Bruce Andrews, among others, Ngai shows how art turns to ugly feelings as a site for interrogating its own suspended agency in the affirmative culture of a market society, where art is tolerated as essentially unthreatening. 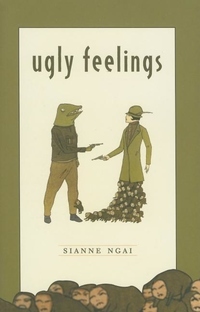 Ngai mobilizes the aesthetics of ugly feelings to investigate not only ideological and representational dilemmas in literature--with a particular focus on those inflected by gender and race--but also blind spots in contemporary literary and cultural criticism. Her work maps a major intersection of literary studies, media and cultural studies, feminist studies, and aesthetic theory.